Your neighborhood is a mission field. 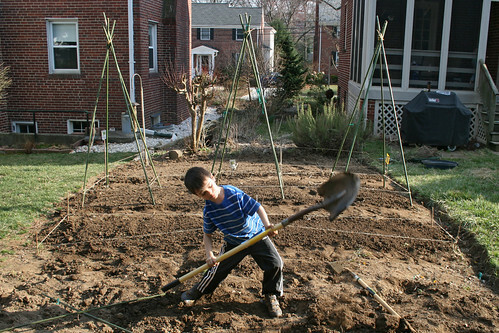 Serving the community can be as simple as helping to plant a garden (cc image courtesy of woodleywonderworksvia Flickr). Churches occupy concentric circles of community. The innermost community is the congregation, then the neighborhood and the town, then on to the country and the world. Many churches have calendars packed with activities for churchgoers on the inner circle and mission boards for outreach to the outer circle, but caring for the middle circle—the neighborhood—can often be overlooked. Your church can’t be a blessing to its neighbor’s unless it knows them. If you are on staff at a church go shake your neighbors hands. Invite them to church events. Ask them if there is anything the church can do for them. Once the relationships are in place, opportunities to bless the real needs of your neighbors will present themselves. Get involved in what is already happening. Many neighborhoods have community initiatives already in place. Use the church’s resources to help the things already happening in the community grow and flourish. Encourage the congregation to see the immediate community as a mission field. When we hear the word “missions” we tend to think of overseas missions, but the whole world is a mission field—no less your neighborhood. There is as much value in helping a neighbor fix his house as repairing someone else’s across the world. Here are a few ideas for how your church can be a blessing to its neighbors. Read through the list, get together with other members of your congregation, and start brainstorming what fits your neighborhood! Landscape the neighborhood. What would it say to your neighbors if your church used its resources not only to make the church’s land beautiful, but the whole neighborhood’s? This could look like planting flower beds in community areas, mowing lawns, or helping homeowners in the community with projects. Host neighborhood dinners. The simple gift of hospitality can go a long way in getting to know people in the community and communicating love to them. Grow a community garden. As the story of the Anathoth Community Garden shows, sometimes one of the best things a church can do for a community is provide them with food. A garden is a great way to get people outside together, give people a common goal to work toward, and put healthy food on your neighbor’s tables. Offer your church as a meeting spot. Churches can be great places to host fundraisers, PTA meetings, or even farmer’s markets. Find out what your community’s space needs are and then offer your building to help fulfill them. Create a community skills inventory. One thing that makes any community strong is the sharing of gifts and services between members of the community. Your church can facilitate this by creating a community skills inventory and connecting the people with needs to the people that can help them. Build a community tool shed. Offering your church’s tools to the neighbors is a great way to help address tangible needs in the community. Create a check-out system where your church’s neighbors can check out tools when they need them. If you see someone checking out a tool, ask them what they are working on and offer to help.